Amatrol’s Design of Structures 1 Learning System (94-DOS1) serves as an introduction to civil engineering and covers the design, construction, and analysis of structures such as bridges, buildings, and tunnels. Design of Structures introduces learners to the various roles that civil engineers can assume in the residential, transportation, and industrial fields. 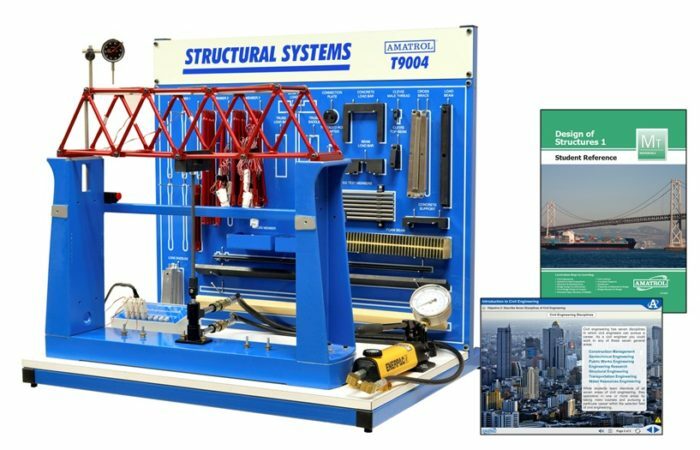 This system features world-class curriculum that intertwines theoretical lessons such as how to calculate the bending stress in beams with practical skills like building and testing a Warren Truss bridge. The Design of Structures training course includes two bridge component sets that can be used to construct a variety of Truss bridges, a beam component set to show how different loads affect beam stress, and a data acquisition system to test the stress on various components. These components will help learners to build skills that can be applied in the workplace, which is one example of how Amatrol transforms the global workforce one life at a time. One of this system’s strengths is the project-oriented approach that allows learners to directly apply theoretical knowledge to hands-on skills. In fact, Design of Structures actually lets learners build scale models of Warren, Howe, and Truss bridges. After studying topics such as the different types of bridges, the forces acting against bridge structures, and the common methods of analysis, learners will assemble the bridges from supplied components and then test and analyze how different forces act on the structures to show the advantages and disadvantages of each structure. Using strain gauges, the most common sensor used to measure internal forces in structural elements, learners will generate actual computerized analysis using a real-world data acquisition system that reads various input devices. Learners can use these components to gain experience in data acquisition by collecting and displaying strain gauge output using the data acquisition equipment and software. The interactive multimedia curriculum brings structural design to life by engaging the students in interactions such as having the learner apply a load to different types of structures to test their stability. The use of animations, 3D graphics, and audio takes the learning experience to a new level! After completing Amatrol’s Design of Structures 1, learners can expand to the Design of Structures 2 (94-DOS2), which covers beam deflection, column buckling, concrete, and building design / construction. Learner will complete skills such as calculating the deflection of beams, mixing and forming concrete beams, and determining building load paths. A sample copy of the Design of Structures Student Reference Guide is also included with the system for your evaluation. Sourced from the system’s multimedia curriculum, the Student Reference Guide takes the entire series’ technical content contained in the learning objectives and combines them into one perfect-bound book. Student Reference Guides supplement this course by providing a condensed, inexpensive reference tool that learners will find invaluable once they finish their training making it the perfect course takeaway.